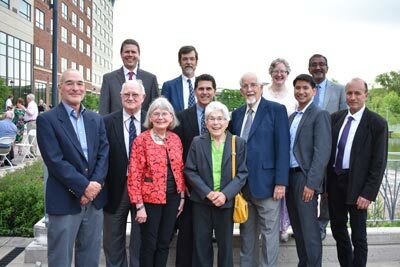 Ophthalmologists and alumni from across Iowa, the U.S., Canada, and Australia returned to Iowa City for the 2018 Iowa Eye Annual Meeting and Alumni Reunion. The meeting featured a fantastic program of distinguished speakers, stimulating talks, and interesting cases. Review the talks and lectures: http://bit.ly/2t6WFV7. Plus, we recognized neuro-ophthalmologist and emeritus faculty member, Dr. H. Stanley Thompson. Many of Dr. Thompson’s former fellows were in town to help us celebrate his career and legacy. Those interested in honoring Dr. Thompson may wish to support the H. Stanley Thompson, MD Neuro-Ophthalmology Fund (Donate to the H. Stanley Thompson, MD Fund). Thank you! Mark your calendar and plan to join us next year for the 2019 Iowa Eye Annual Meeting and Alumni Reunion in June 2019.